TheSize is pleased to present the II Edition of the Neolith Design Competitions. This year, the competition will have an international profile with the aim of capturing the Neolith projects and ideas developed by worldwide Architecture and Design professionals and students. Targeting professionals who have recently developed a Remodeling/Refurbishment Project employing Neolith surfaces to showcase the versatility and the applicability of the material in the project. The Judges will be evaluate, among other things, the proposal originality, the creativity in the project’s presentation, the technical complexity, the use of Neolith in different applications as well as the before and after images of the remodeling (and its quality) and the degree of environmental sensitivity in the project. 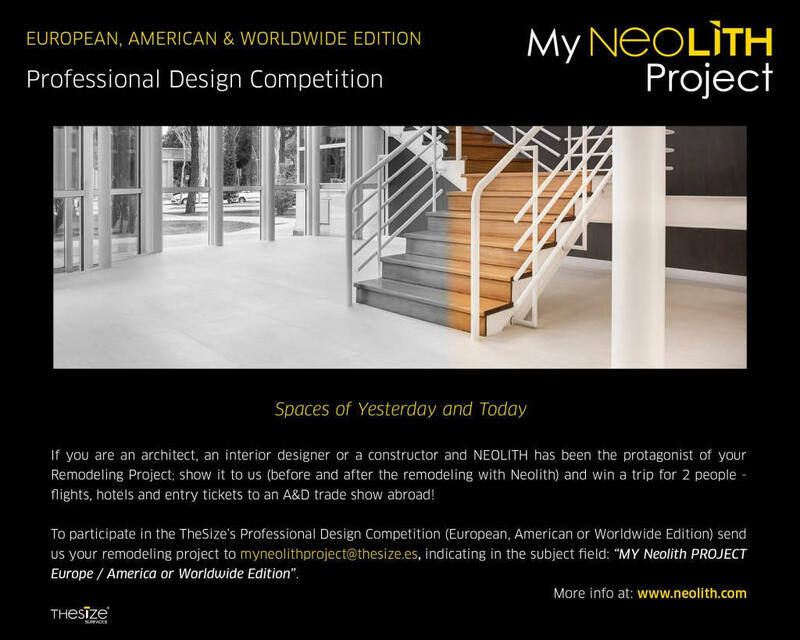 The Remodeling projects should be sent to myneolithproject@thesize.es, indicating in the subject field: “MY Neolith PROJECT Europe / America or Worldwide Edition”. This year’s topic will be “The Neolith Restaurant of the Future” where the goal will be to design an innovative gastronomic space able to stimulate simultaneously the 5 senses employing Neolith as the main architectural surface. Also in this case, judges will value the originality and the creativity of the proposal as well as the different Neolith applications used in the designed space. The Neolith conceptual project proposals should be sent to neolith_newtalents@thesize.es, indicating in the subject field: “Neolith NEW TALENTS Europe / America or Worldwide Edition”. The winners of the professional competition (MY NEOLITH PROJECT) will win a trip abroad to a different continent for 2 people (flights, hotels, and tickets to a trade show for prize-giving ceremony) valued at a maximum of 5,000€. The winners of the students competition (NEOLITH NEW TALENTS) will also win an overseas trip (within their continent) for 2 people valued at 1,500€. Both trips includes the tickets to a trade show to visit the Neolith’s booth in KBIS 2016 (Leading Kitchen and Bath Industry Show) in Las Vegas (USA) or in Living Interiors 2016, the prestigious European event for bathroom, flooring and wall coverings in Cologne (Germany). For more information, check the Official Rules of each competition on the Neolith website (“Downloads” / “Other”). – Luís Vidal, renowned international architect. – Marco Rebora, founder of Restaurant & Bar Design Awards in UK. – MaryJo Camps, KBCD, designer and member of the National Kitchen and Bath Association (USA). 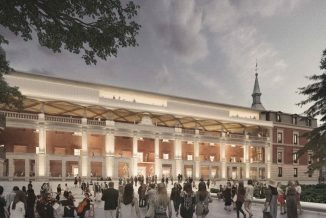 – CDICV, Interior Designers Association of Valencia (Spain). – Members of ASCER (Spanish association of tiles and ceramic floor tiles manufacturers). – Architectural Digest magazine, Interior and Decoration publication (national and international benchmark in decor and lifestyle). – Tu Reforma magazine specialized in Remodeling, Architecture and Construction. – Representatives of Neolith by TheSize Surfaces. The announcement of the competitions is open from May 1st to December 1st.